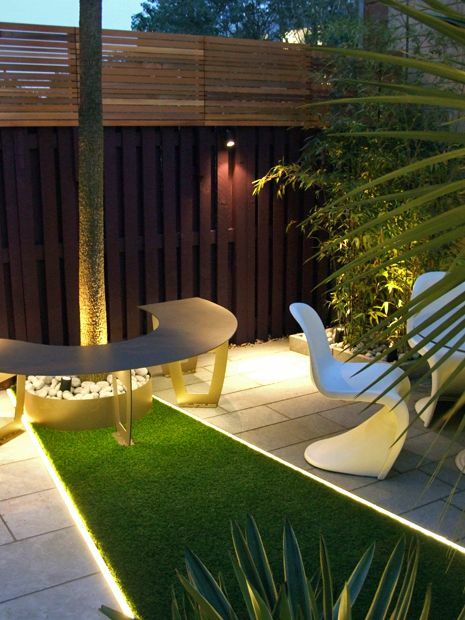 When our clients in North London's Highbury approached us to design and build their small garden, the 40-square-metre outdoor space featured mere railway sleepers and ghastly gravel. 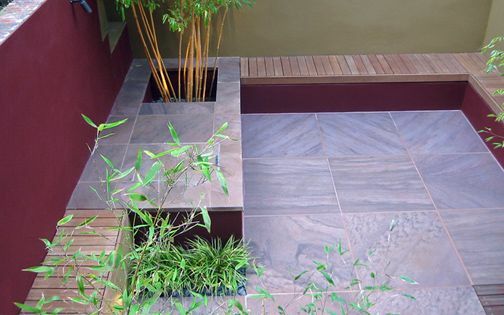 The pocket-sized garden, however, contained a collection of mature Palm trees and thriving Bamboo. We sought to elevate architectural essence by designing a vivid lightscape, sustained in a minimalist layout tailored to enhance fluidity with a modern interior, while conserving valuable flora. The Italian residence is furnished in daring colour palettes and eclectic, contemporary art across four roomy floors, where its back garden was transformed into a central focal point – enjoyed from every vantage point by family and guests through the seasons. We returned a while later to reinvent the indoor planting throughout the residence, and with ample daylight emanating through skylights, portholes and expansive glass elevations, a myriad of tropical flora was integrated into the mezzanine levels. 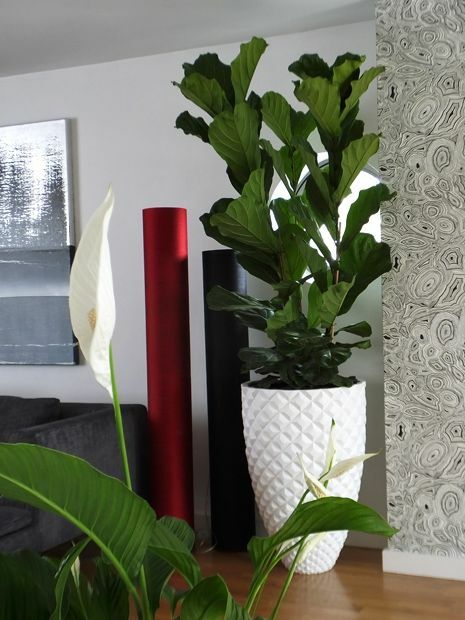 We utilised white, textured fibreglass vases in varied scale to display luxuriant foliage. Strelitzia reginae, the Bird-of-paradise native to South Africa, frames an Andy Warhol artwork in its matching vivid orange petals. Spathiphyllum, the Peace lily from South America, produces soft, tactile contours along a glass balustrade by the living room entrance. Ficus lyrata, the Fiddle-leaf fig native to West Africa, filters light through its architectural foliage, while adding scale and substance opposite the Lilies. 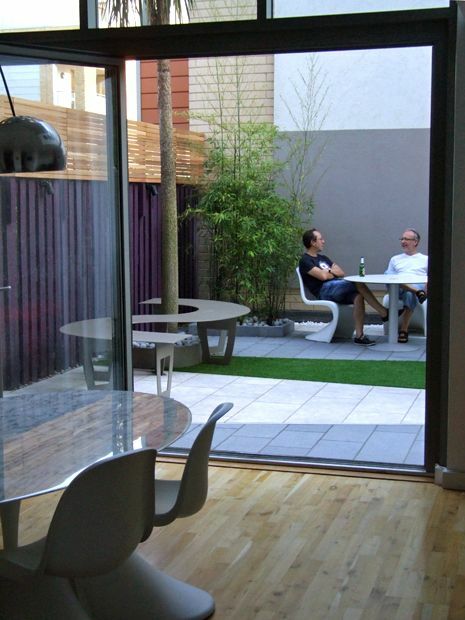 Our Italian clients love to entertain, and we enjoyed warm hospitality during the project and in subsequent visits. 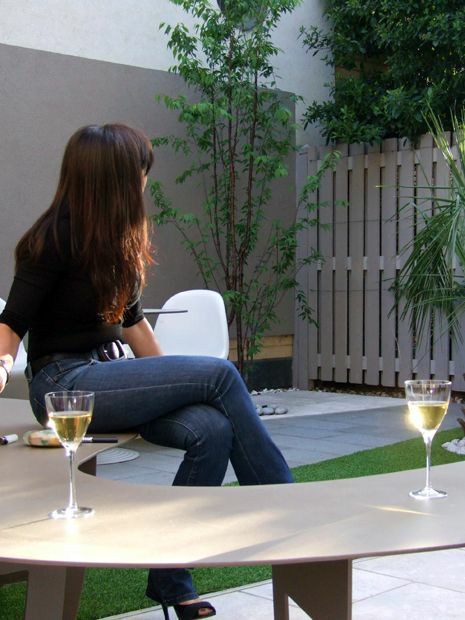 Having spent much time together, and met their family and friends, we knew the transformed garden will provide a pivotal hub in sustaining an effortless alfresco lifestyle. 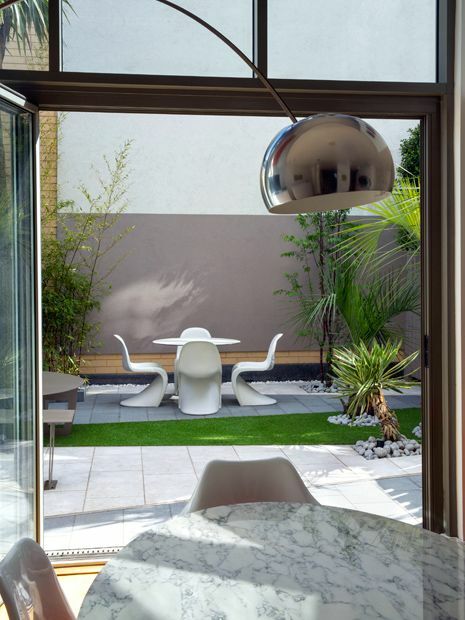 While the open-plan kitchen features an oval Eero Saarinen Tulip dining table, aligned perfectly along the garden's main axis, the outdoor layout enhances this view via bi-folding doors. 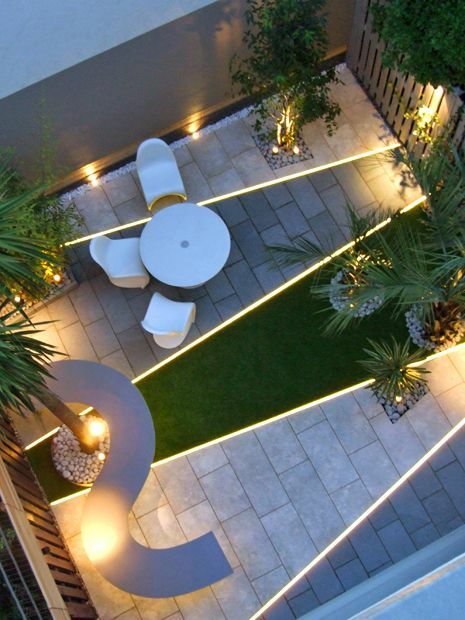 The similarity in size of both interior and exterior spaces within the ground floor is maximised into a cohesive, expansive outline of garden design luxury. To conserve existing trees, we designed a diagonally linear layout, where its geometry achieves a balanced composition, narrated by an interplay of natural stone and LED strip lighting. Bands of granite and calcified limestone form alternating contrast, while a central artificial grass section adds verdant variation. We sought to define minimalist clarity by expressing clean lines in keeping with our clients' modern home. The before and after photos highlight the retrofitted outline which snugly traverses architectural tree trunks, appearing in situ. Inspired by our clients' Mid-century Modern furniture collection, and requiring curvilinear silhouettes to contrast linear shapes, we infused fluid forms as sculptural focal points. The dining table's oval outline was reiterated in a sinuous bench design, while bespoke vases curve upwards, displayed as a duo by the kitchen's window. This interplay of contours produces energising vistas from the upper levels, as well as generating captivating shadows under the sun's diurnal arc. The seating areas face west, soaking up afternoon sunshine below a Cordyline palm tree's lofty canopy. While the end-of-terrace house is well-screened along the street, its west-facing boundary features an expanse of blue sky and greenery from neighbouring properties. 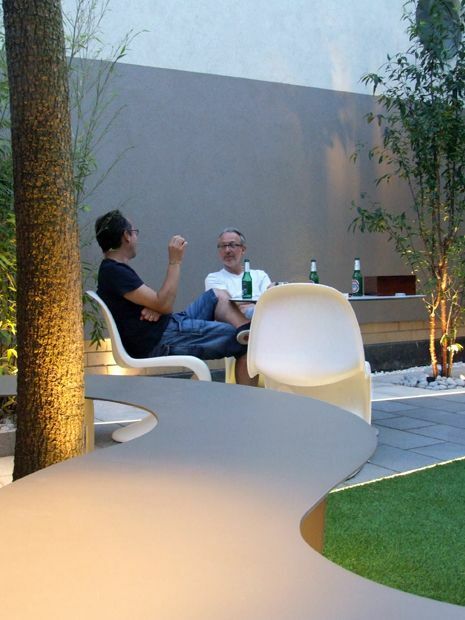 The garden conveys our low upkeep design approach, where socialising zones are utilised often, and an indoor-outdoor setting is maximised through all types of weather. 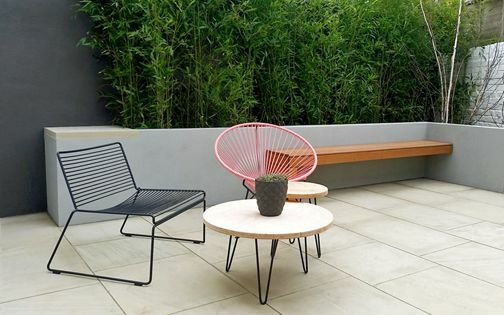 Synthetic grass, powder-coated planters and a steel bench provide warm tones; luminescent during daytime, and highly conducive to night-time garden lighting. 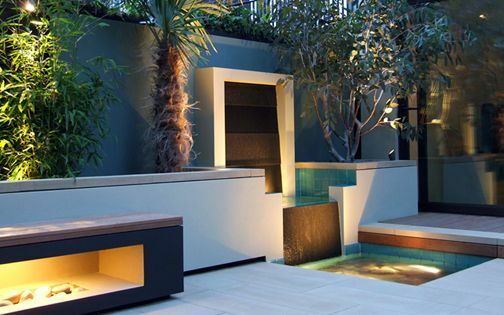 At sundown, the garden transforms into an opulent outdoor platform, renewed by well-lit geometric outlines and Palm trees which generate enduring, sculptural silhouettes. 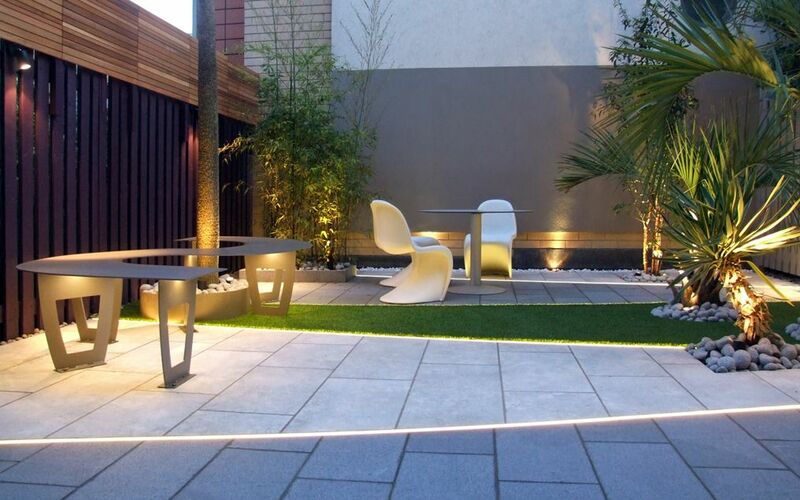 Utilising lighting techniques we often integrate into our city roof terraces, the matrix of gleaming LED lights crisscrossing the space invigorates the multitude of vistas throughout this modern home. Uplighting the tree trunks unveils textural bark, while downlighting from Cedar cladding reproduces the curvature of the bench onto the limestone below, augmenting sense of depth. 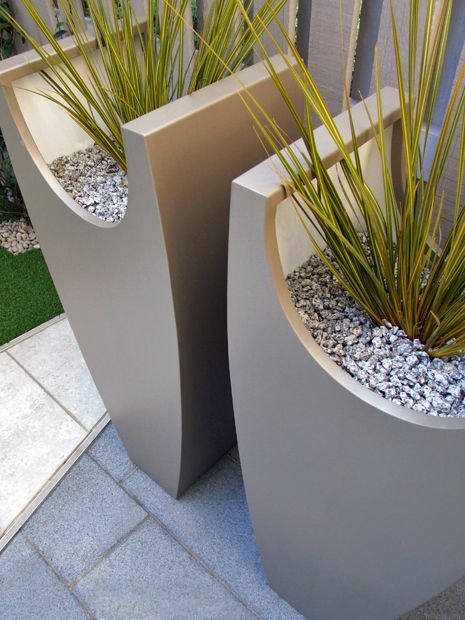 We design countless bespoke signature planters; custom-made and tailored for a perfect fit, to form distinctive focal points unique to each site and client. 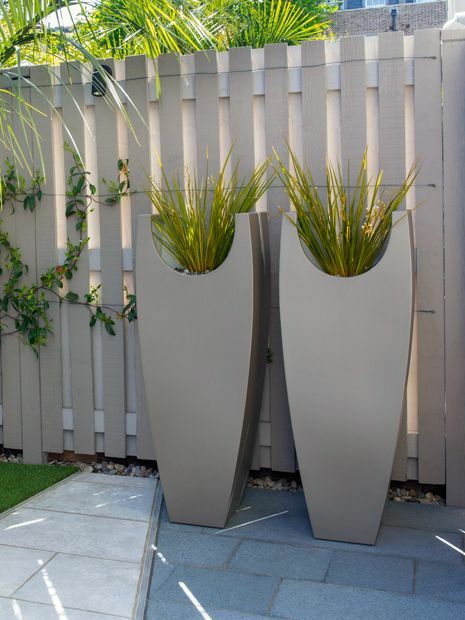 The pair of tall streamlined vases outside the kitchen window is powder coated in taupe, and features Libertia ‘Goldfinger’ from New Zealand. The grassy orange foliage contrasts delicate white flowers in summertime above a vibrant, invigorating evergreen tuft. 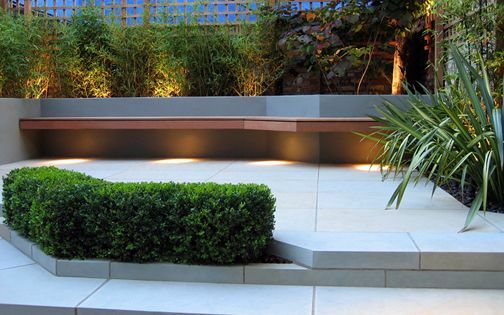 The all-weather planters, and aptly low maintenance perennials, produce an elegant, low-key sculptural composition. 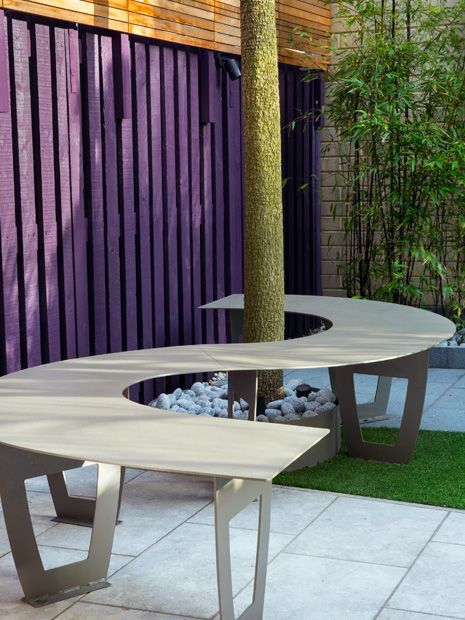 We crafted the sinuous, powder-coated bench by utilising 10mm-high steel, and while distributing its weight equally onto slim uprights, the structure forms a solid seat, yet appears distinctly lightweight. An LED light emits a mellow afterglow in the cavity below the seating, with ample ergonomic legroom. Curving around a mature Palm tree's tall torso, the bench infuses a sense of continuity between the garden's previous setting and its new design. This asymmetrical composition traverses the layout's quartet of surface materials, highlighting a diverse spectrum of textures within a minimalist detail design. 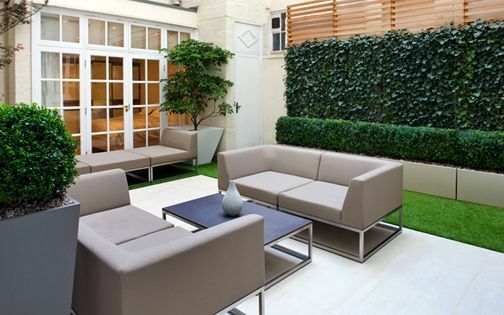 While we frequently utilise synthetic grass as a functional surface in many roof terrace schemes and outdoor play areas, here in Highbury, this material forms a purely decorative layer. 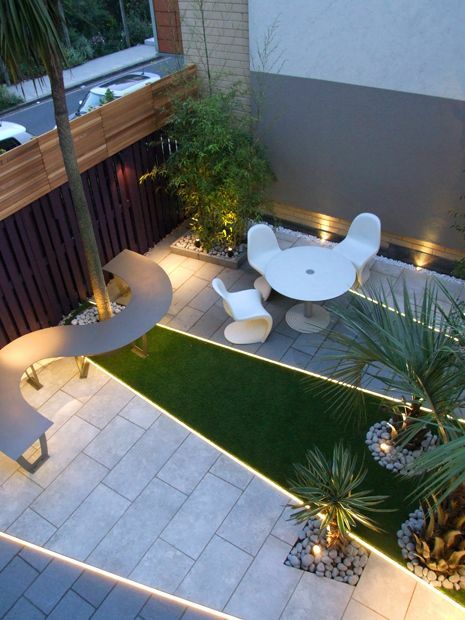 Without conventional planting borders, amid a minimalist flora palette, the artificial grass provides vivid verdancy, fusing tree canopies with the garden's floor. Viewed from an aerial perspective throughout the entire residence, this green band, shaped as a tapering trapezium, supports a readily low maintenance garden design as an all-year-round grassy illusion. North London is our home, where we enjoy the sprawling topography of a Hampstead rooftop landscape, Highgate's expansive panoramas and the hustle and bustle of Islington, Highbury and Camden Town. Following the culmination of this project, we continued to reinvent the neighbouring family garden, creating a play area for the kids. For our Italian clients, London is home most of the year, except during summer, when the Tuscan hills provide a perennial port of call! 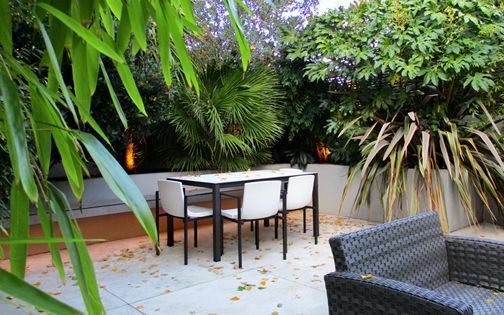 This small town garden, however petite, remains a constant and soothing sanctuary for ten months of the year, when North London presents the backdrop for a dynamic and highly bespoke garden design. 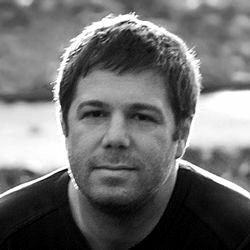 The success of this project was certainly achieved through boundless client reciprocation within a multidisciplinary practice; at times, when both a site and owners provide inspiration, our work seems easier to accomplish. 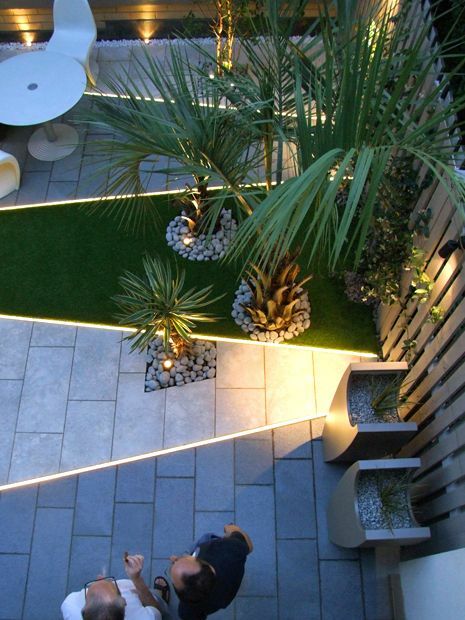 The possibility to produce a cohesive vision for the entire residence, encompassing the frontage, back garden, roof terrace and indoor planting, enabled us to maximise not only the site's potential, but also our own garden design ideas. When such project frameworks are formed in a North London locale, their nearness propels zealous garden design artworks – naturally nurtured just a little more niftily.